EVA Foam Sheet Die Cutting Machine is one of hydraulic die cutting press machine used for cutting eva foam sheet ,The EVA is one of the materials popularly known as expanded rubber or foam rubber which is an elastomeric polymer that produces materials “rubber-like” in softness and flexibility.The foam is also knokn as sponge sheet . 2. The machine have large size cutting bed designed based on your production requirement.The die can be amounted under the beam or up on the table . 3.It is automatic feed eva foam sheet into the cutting bed or manual feed into the cutting bed for cutting jobs. 4.The machine is using for post or column design and high quality hydraulic system to make sure the stable and high efficiency. 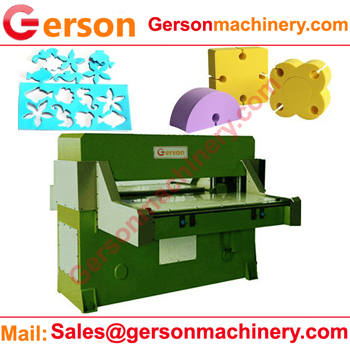 5.If you’re searching for a particular foam manufacturing cutting equipments, here you’ll discover more regarding what we can offer you.Gerson also can custom design and manufactue any machinery to meet your requirement.